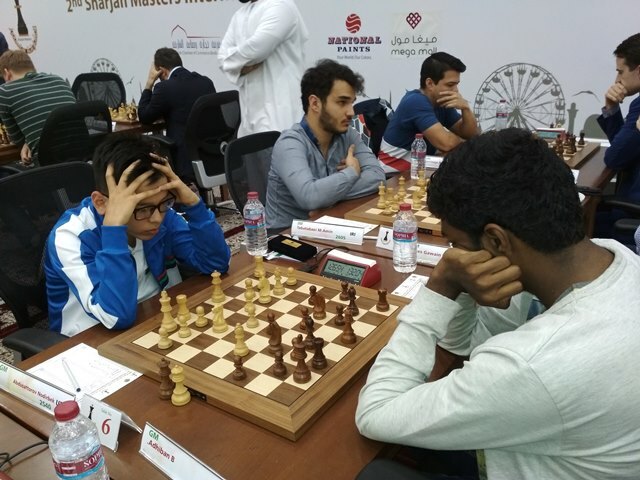 Maghsoodloo Parham, the young Iranian grandmaster emerged sole leader with an astonishing all wins record at the end of the sixth round of the 2nd Sharjah Masters International Chess Tournament, organised by the Sharjah Chess & Cultural Club, the biggest chess club in the world. SP Sethuraman of India, Arkadij Naiditsch and Safarli Eltaj of Azerbaijan, Gowain Jones of England and international master Oliver Dimakling of Philippines are one full point behind the leader. The tournament has attracted 32 grandmasters (23 of them above 2600 and 5 above 2700) and 16 international masters from 28 countries. India accounts for 45 of the 118 players and the tournament carries a prize money more than 57000 USD. With a win over the top seed Wang Hoa of China in the fifth round, Maghsoodloo maintained his good nick to outwit SP Sethuraman. He fianchettoed both bishops in his Reti opening, and after a series of exchange of minor pieces and a rook, Maghsoodloo had a slight advantage, irrespective of the Black rook controlling the open file. He developed the advantage into a winning position and forced the queen exchange to pocket a point in 49 moves. 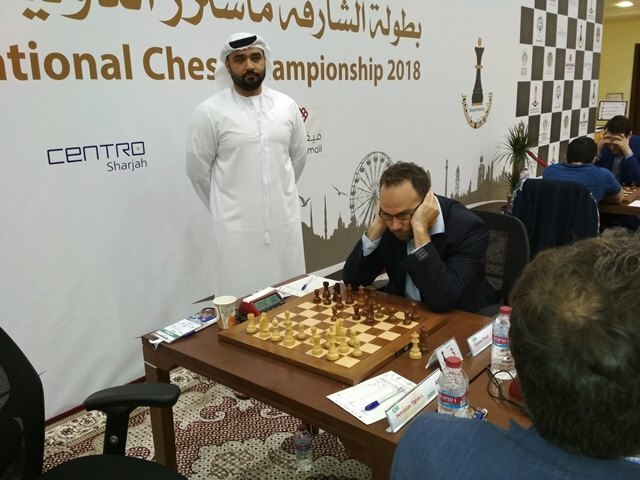 In the Kings Indian defence game, Arkadij Naiditsch of Azerbaijan built up a better position slowly against Kovalev Vladislav of Belarus. Though he had many pawn islands compared to that of just two of the opponent, Arkadij’s pieces were well placed while Kovalev’s pieces were literally inactive. Kovalev had to give up his bishop for a pawn to consolidate his position but it was too late and of no use. Arkadij won the game convincingly in 59 moves on the second board. Top seeded Wang Hao of China handled the Semi Slav of Queens Gambit Declined game very well, exploiting the inaccurate opening of SL Narayanan of India. Narayanan lost two pawns on 11th and 18th moves to leave a big void on the queen side. After exchanging the queens on 20th move, Wang’s advantatge grew in the resultant rooks and pawns ending. 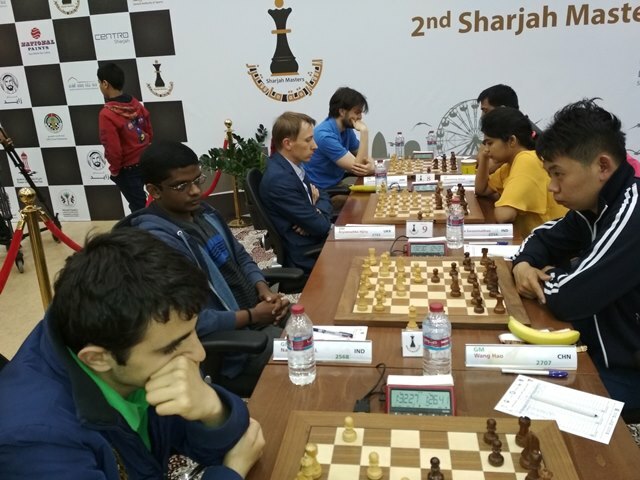 Narayanan gave up the fight when Wang’s c- pawn was racing towards the eighth rank. Wang was a relieved man after a loss and a draw in the previous two rounds. 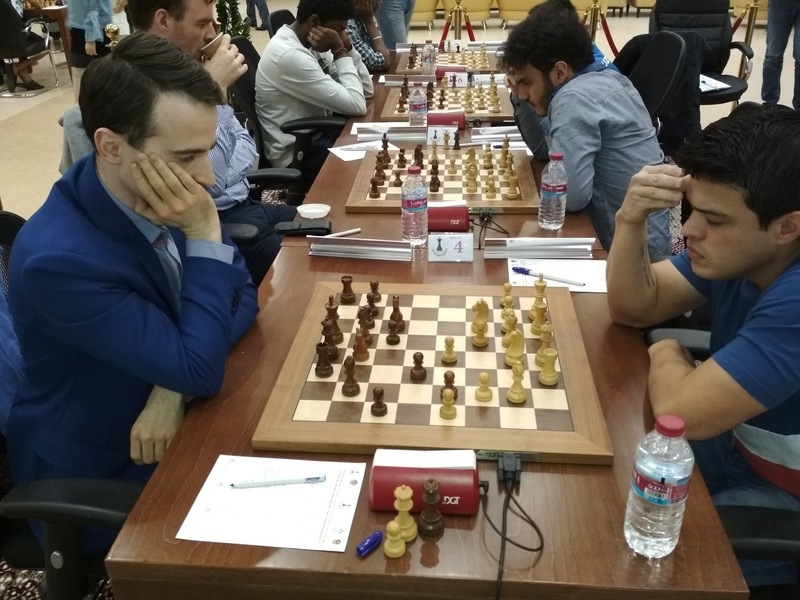 Another grandmaster Tabatabaei Amin from Iran ended on the losing side to grandmaster Gowain Jones. When the position looked drawish towards the end in a Ruy Lopez opening adopted by Amin, he made a wrong king move to h5, the game was tilted in favour of Gowain Jones. In a Najdorf variation of Sicilian defence, Indian international master NR Vignesh miscalculated to sacrifice his knight trying to repeat the checks to the open king of Safarli Eltaj of Azerbaijan. But Safarli cleverly defended the position to post a win on 49 moves. 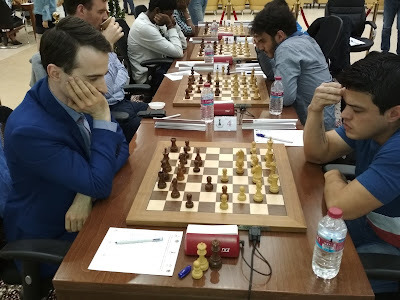 In the only upset on the top boards, Oliver Dimakling’s extra pawn on the queen side was vital to force a win over Nils Grandeluis of Sweden.